TriHEPA design allows for significant airflow. Three individual filter sets each containing a prefilter, HEPA, and carbon blanket. Easy to access filters through a removable end-panel door. Third stage Ultra VOC canister upgrade available. Optional alternative configurations available just by changing the filter sets or type of carbon. Recommended to suspend and hardwire. 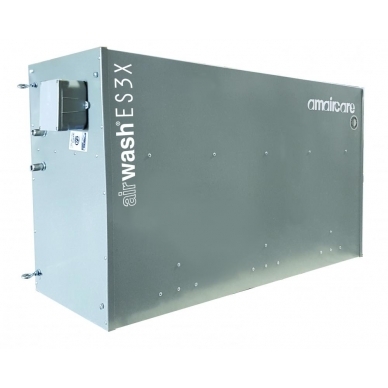 The 3 Filter Sets are contained and protected within a durable steel cabinet. Three sets of filters capture large particulate and light VOCs with the first stage foam prefilter, harmful and irritating particulate are trapped with the second stage HEPA filter that locks in place and light chemical/gas pollution are adsorbed by the third stage carbon VOC filter. The configuration in this unit contains 3 filter sets each with a prefilter, a HEPA filter, and a Carbon blanket (not a carbon canister). Easy Twist HEPA locks into place to ensure the filter is completely sealed in the unit and all polluted air is forced through the filter. 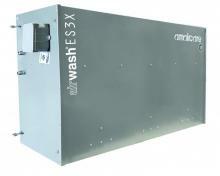 Durable long lasting housing that doesn’t off-gas chemicals, true to the integrity of providing clean air. Front panel conveniently removes for easy filter maintenance. Optional Stage 3: 21 lb Carbon Canister** (3 - 7 lbs of carbon per a canister). Not used in the HEAVY VOC configuration. * Denotes Filters used in this configuration. ** Unit comes with activated carbon. However, carbon can be specialized based on your needs such as formaldezorb, acidzorb etc. The unit uses a quantity of 3 filter sets. 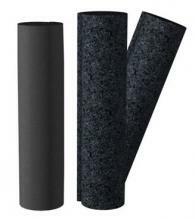 Each set contains a prefilter and carbon canister. Particulate Focus & Light VOCs (Shown): Carbon Prefilter - HEPA - Carbon Blanket. Qty of 3 sets per a unit. 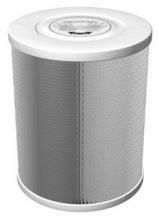 Particulate Focus & Moderate VOCs: Carbon Prefilter - HEPA - 7 lb Carbon Canister. Qty of 3 sets per a unit. Focus on Heavy VOCs, gases, & Odors: Carbon Prefilter - 30 lb Carbon Canister. Qty of 3 sets per a unit. PLEASE NOTE: No HEPA in this configuration. **Something to keep in mind is that the machines are identical, the filters vary based on filtration needed. With this in mind, if the usage changes with time, you can simply change your filter configuration to match your filtration needs. View the Amaircare Product Catalog by Visiting Amaircare Product Catalog. *Download Activated Carbon Adsorbency Ratings for Amaircare VOC Air Purifiers by clicking here.